Place Gabriel Rambaud is covered with around 300 solar energy lamps linked to a weave of electroluminescent ribbons. Featuring shimmering effects, perforated designs, graffiti, films and mirrors, each lamp is unique, producing a different pattern that creates a restful atmosphere throughout the square. 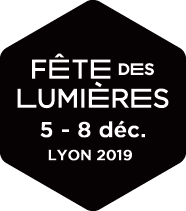 These hundreds of separate lights have been created by inter-generational workshops, involving the charity Les Petits Frères des Pauvres and the residents of care homes and day centres throughout the city.